As its name implies, the hackberry petiole gall psyllid forms woody galls on the leaf petioles of its hackberry (Celtis spp.) hosts. 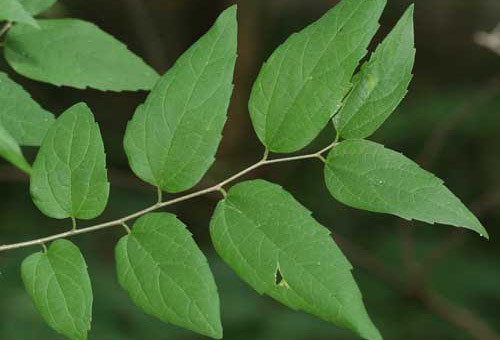 Our native Florida hackberry, Celtis laevigata Willd., is called sugarberry. The petiole gall psyllid is usually not sufficiently abundant to cause serious damage to its host, but gall infested leaves are unsightly during late fall and winter. Figure 1. Petiole gall on sugarberry, Celtis laevigata. Photograph by Jerry F. Butler, University of Florida. 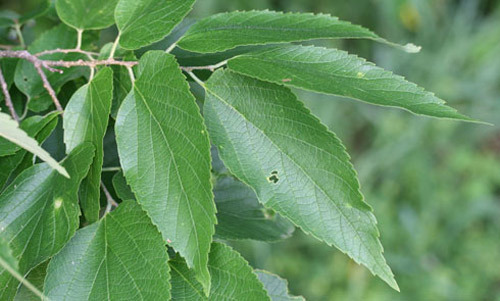 The petiole gall psyllid is found throughout the range of its four hackberry hosts - from Connecticut to Idaho, southwest to Arizona and southeast throughout Florida. Adult petiole gall psyllids are fairly large for psyllids (5.0 to 6.0 mm to tip of folded wings) and resemble small cicadas. They are dark colored with tawny markings. The dorsum of the thorax is longitudinally striped. The forewings are whitish with black spots. 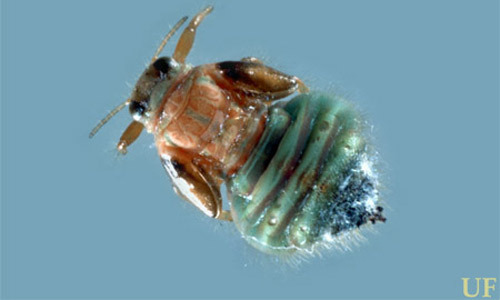 The full-grown nymph has a green head with brown markings and a green thorax with four light reddish-brown longitudinal stripes. The wing pads of nymphs are brown. The abdomen is green with dark brown transverse bands. Figure 2. Adult hackberry petiole gall psyllid, Pachypsylla venusta (Osten-Sacken). Photograph by Jerry F. Butler, University of Florida. Last instar nymphs emerge from the galls in spring and molt to the adult stage as new leaves are opening on the host trees. The apex of the abdomen of the last instar nymph is armed with heavily sclerotized teeth which the nymph uses to cut its way out of the woody gall by wagging the tip of the abdomen. Figure 3. Petiole gall psyllid nymph, Pachypsylla venusta (Osten-Sacken), with gall showing individual compartments. Photograph by Jerry F. Butler, University of Florida. Figure 4. Petiole gall psyllid nymph, Pachypsylla venusta (Osten-Sacken). Photograph by Jerry F. Butler, University of Florida. Figure 5. 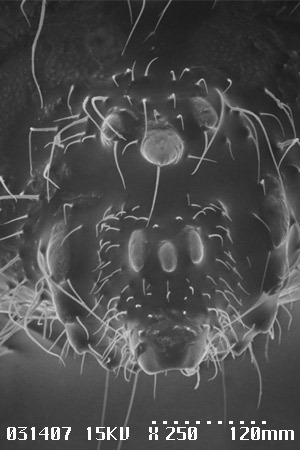 Dorsal view of tip of abdomen of petiole gall psyllid, Pachypsylla venusta (Osten-Sacken), showing abdominal cutting teeth (scanning electron micrograph). Photograph by Harvey L. Cromroy, University of Florida. Figure 6. 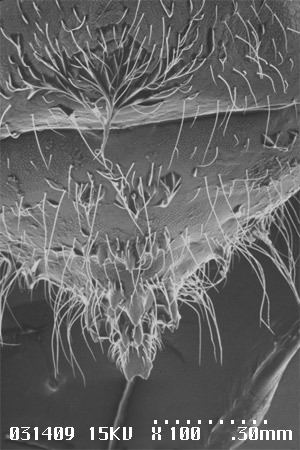 Apical view of abdomen of petiole gall psyllid, Pachypsylla venusta (Osten-Sacken), showing abdominal cutting teeth (scanning electron micrograph). Photograph by Harvey L. Cromroy, University of Florida. Subspherical galls form around the young nymphs. 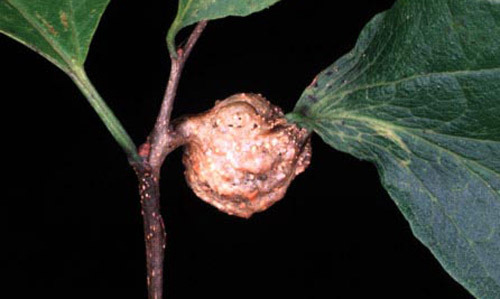 Galls are polythalamous (having several developing individuals in separate compartments) with each compartment lined with wax. I have found as many as 13 nymphs per gall. Nymphs develop throughout the summer and overwinter as last instars. 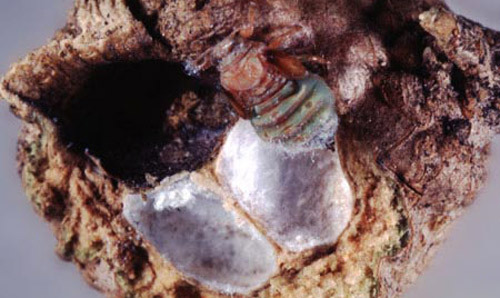 As in the other species of gall-forming hackberry psyllids, many petiole gall psyllid nymphs are parasitized by Hymenoptera larvae. Infested leaves die in the fall instead of undergoing abscission and do not fall from the trees. Heavily infested trees are recognizable during the winter by the presence of the dead leaves after uninfested leaves have fallen from the tree. Because significant damage to the tree does not result from infestation, control of hackberry petiole gall psyllids is not recommended. 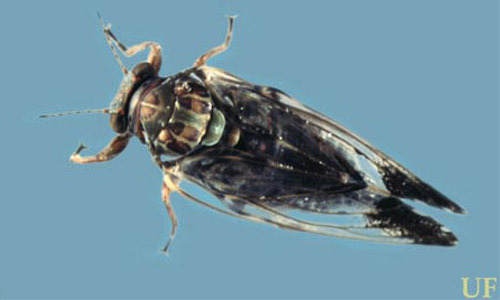 Most species belonging to the suborder Sternorrhyncha (which includes the psyllids) have piercing-sucking mouthparts and are phloem feeders. It is believed that their diet is often deficient in certain required nutrients and, for this reason, most have intimate associations with endosymbiotic bacteria (or sometimes other types of microorganisms) that synthesize the required nutrients. These endosymbiont bacteria are typically housed within specialized cells known as bacteriocytes which are themselves aggregated to form a structure known as a bacteriome (Baumann 2006). The symbionts have dramatically reduced genomes, and it is believed that many lack sufficient DNA to code for some of their own critical functions and may be dependent on the insect host bacteriocytes for these functions. Carsonella ruddii, the endosymbiont of the hackberry petiole gall psyllid, is remarkable for having the smallest known bacterial genome with only about 160,000 base pairs - only about 1/3 the size of the next smallest genome which is found in an aphid endosymbiont, Buchnera sp. (Nakabachi et al. 2006). There are three hymenopterous parasitoids listed from the hackberry petiole gall psyllid (Krombein et al. 1979). Two trees in the family Celtidaceae are hosts for the hackberry petiole gall psyllid. These are hackberry, Celtis occidentalis L., and sugarberry, Celtis laevigata Willd. Figure 7. Hackberry, Celtis occidentalis L. (Celtidaceae), is a host for the hackberry petiole gall psyllid, Pachypsylla venusta (Osten-Sacken). Photograph by Don Hall, University of Florida. Figure 8. Sugarberry, Celtis laevigata Willd. (Celtidaceae), is a host for the hackberry petiole gall psyllid, Pachypsylla venusta (Osten-Sacken). Photograph by Don Hall, University of Florida. Baumann, P. 2006. Diversity of prokaryote-insect associations within the Sternorrhyncha (psyllids, whiteflies, aphids, mealybugs). In Bourtzis K, Miller TA (editors). Insect Symbiosis. CRC Press, Boca Raton, Florida. Vol. 2: pp. 1-24. Johnson WT. 1988. Insects That Feed on Trees and Shrubs. 2nd edition. Cornell University Press. Ithaca, New York. pp. 452-453. Nakabachi A, Yamashita A, Toh H, Ishikawa H, Dunbar HE, Moran NA, Hattori M. 2006. The 160-kilobase genome of the bacterial endosymbiont Carsonella. Science 314 (Issue 5797): 267. Tuthill LD. 1943. The psyllids of America north of Mexico (Psyllidae: Homoptera). Iowa State College Journal of Science. pp. 534-535. Yang M-M, Mitter C. 1994. Biosystematics of hackberry psyllids (Pachypsylla) and the evolution of gall and lerp formation in psyllids (Homoptera: Psylloidea): a preliminary report. In: Price PW, Mattson WJ, Baranchikov YN. (editors) The Ecology and Evolution of Gall-forming Insects. U.S.D.A. Forest Service (North Central Forest Experiment Station) General Technical Report NC-174. St. Paul, Minnesota. pp. 172-185. Publication Date: October 1998. Latest revision: September 2014.